If you are registered or incorporated in the EU and need an international multiple currency e-commerce merchant account, we can help. We are international payment consultants and do online credit card and EU debit card processing for companies incorporated in European Union and the EU countries of Austria, Belgium, Bulgaria, Cyprus, Czech Republic, Denmark, Estonia, Finland, France, Germany, Greece, Hungary, Ireland, Italy, Latvia, Lithuania, Luxembourg, Malta, Netherlands, Poland, Portugal, Romania, Slovakia, Slovenia, Spain, Sweden, and the United Kingdom. High risk EU merchant accounts available. Expand your reach into new international markets by attracting shoppers from around the world. Process payment transactions anytime using virtually any language or currency. We offer a combination of multi-channel processing through a single solution with pre-authorisation, settlement, high-volume processing, and risk management along with multi-currency support so your customers can pay in their own currency. If you don’t have the desire to manage different bank accounts in various currencies, you need a global e-commerce merchant account. We make fast decisions on merchant account approvals and are successful is securing accounts, even for companies doing business in difficult, high-risk market categories, including eGaming and Travel. Online gaming sites that feature poker, betting services, lotteries and other licensed gambling activities can be approved. Travel agents/clubs, tour operators, real estate agents/brokers engaged in holiday/vacation, beach or ski home or condo rentals. 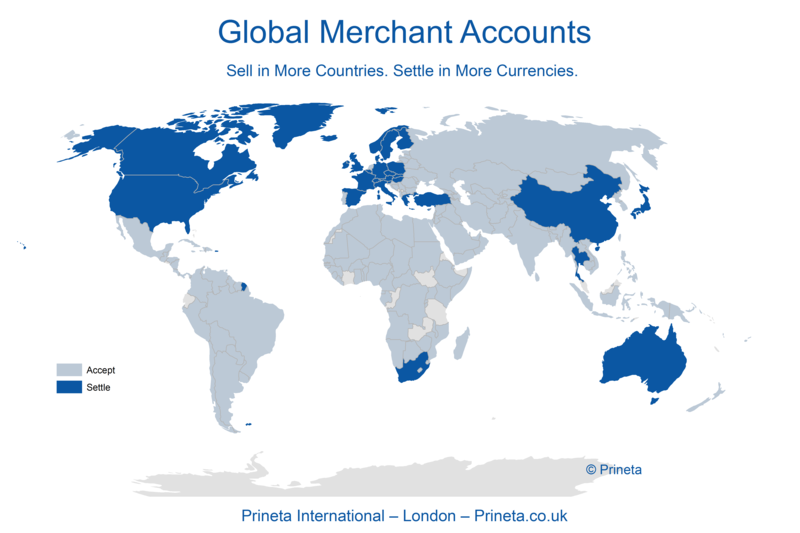 At Prineta, we partner with the industry’s best international e-commerce payment companies to help merchants begin selling worldwide and manage all aspects of selling online in a global economy. We offer secure hosted payment that can be customized in a flexible way to reflect your brand and support a wide array of shopping carts on our gateway. The hosted page is very flexible and the fields appearing on the payment page can be customized. Our solution includes anti-fraud management tools that help merchants minimize fraud and yet to keep conversion ratios at acceptable levels. Within the shopping cart product module, a merchant is able create customized products, set up recurring billing and generate username/passwords for consumers to access websites. The backend of our e-commerce solution provides merchants with role based access to the transactions history database and customizable reports so you can see the full scope of sales data in real-time. Plus, the platform can auto-generate payment support emails at various stages during the purchase process. We spent years evaluating payment processing solutions for international e-commerce merchants and feel confident you will benefit from our experience. Visa, Mastercard, Visa Electron, Discover, Diner’s Club, American Express (AMEX), JCB, China Union Pay, Carte Bleue, Cartasi, Sistema 4B, Postepay, Kankort, Euro 6000, Hipercard, Cabal, Aura, Presto, Italcred,Magna, ripley, Tarjeta Naranja, T Shopping. Sofortuberweisung, Sofortlastschrift, Poli, InPay, Alipay, ELV, Santander, Bancomer, EPS, GiroPay, iDeal, Trustpay, Przelewy24, Servipag, Banamex, IXE, Soctiabank, HSBC, Bradesco. CashU, Ukash, Paysafecard, UATP, AirPlus, Boku, 7eleven, Oxxo, Cobroexpress, Ripsa, Pagofacil, Rapipago, Boleto. • Business to Business Sales- Must be 80% or more B2B and use the approved B2B MCC Codes. If not applicable MCC then account is not B2B and will fall under another category. • Magazine, Newspaper, Newsletter Subscription Services• Mail/Telephone Order• Membership Clubs-Health and Sports (less than 1 year advanced payment, otherwise unqualified). • Non Face to Face Sale of Prescription Drugs acceptable only in compliance with eMP’s policy. • Real Estate Agents/Brokers Engaged in Vacation, Beach or Ski Home Rentals. • Inbound Telemarketing Merchants (MCC 5967)-Audio text or videotext that customers access via phone, fax or internet. As an international payment consultant, Prineta partners with best-of-breed international e-commerce merchant account processors with a proven track record in providing dynamic, robust, innovative and, above all, stable payment solutions for global online businesses. Utilizing state of the art technology and incorporating a system of best practices certified by Lloyds Registry for Quality Assurance (ISO 9001), are partners are the professional payment partner of choice within the online e-commerce arena. Our partners offer excellent bank card e-payment conditions for online shopping. We provide extremely competitive and incredibly effective online payment services for your website on a 24-hour basis. Contact us and we’ll find the best solution for you. Speak with one of our multilingual, multicultural, international payment processing consultants today. 2. Copy of Certificate of Directors and Secretary. 3. Copy of Certificate of Shareholders (if applicable). 4. Copy of Memorandum and Articles. 5. Copy of Licenses (if applicable). 7. Personal Credit Report or Financial Statements of the Business (depending on company type). 8. Copy of Certified Passport for each Director. 9. Copy of Recent Utility Bill. 10. Processing Statements Showing Sales and Chargebacks (if applicable).